Yesterday I got Firefight at Steam. 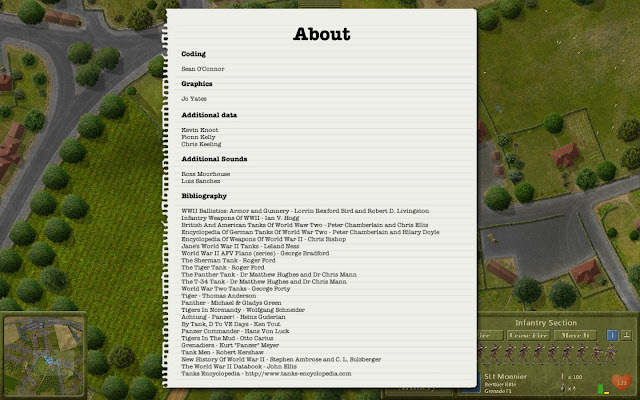 In one form or another, this wargame has been around for quite a while and it was about time it would get formally published. The best way to describe it is as a Close Combat type, top down, continuous time, tactical level wargame. Firefight includes 9 maps but no map editor, and 72 canned scenarios but no scenario editor. 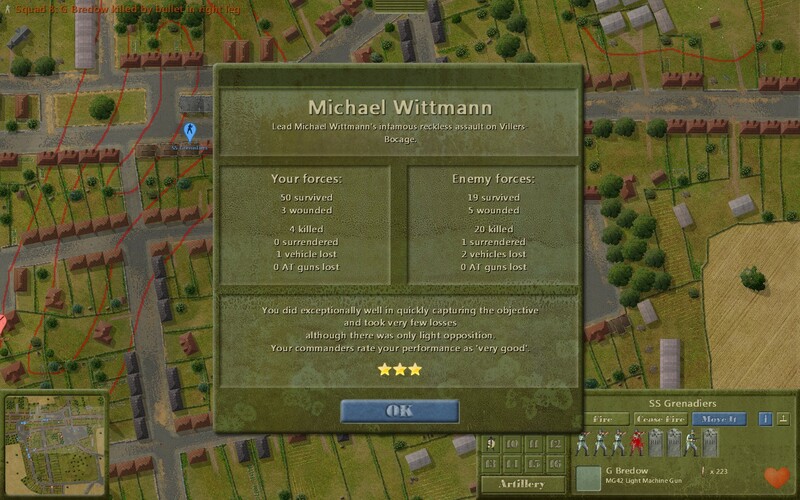 72 scenarios is quite an offer for US $10.00, but people wanting to kick the tires with their own setups as it was possible in Combat Mission will find themselves short of this niceties. There is neither a "campaign mode" nor a multiplayer mode. 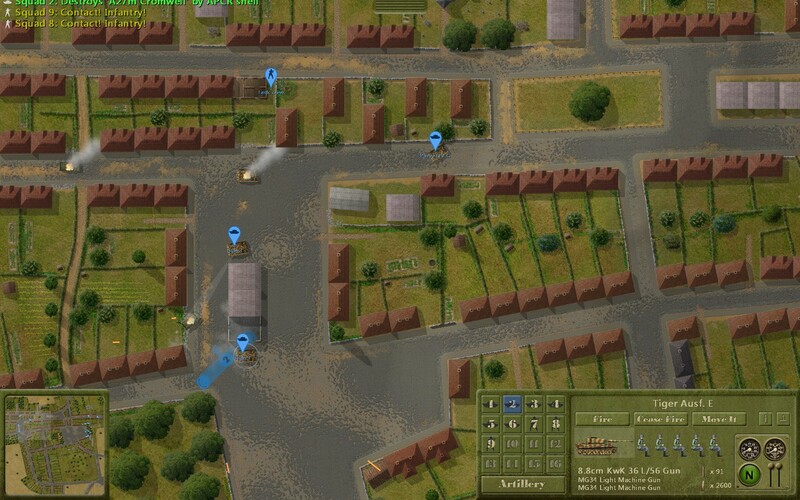 In all the scenarios, the player is attacking (?!) as the Germans, Americans, British or French. 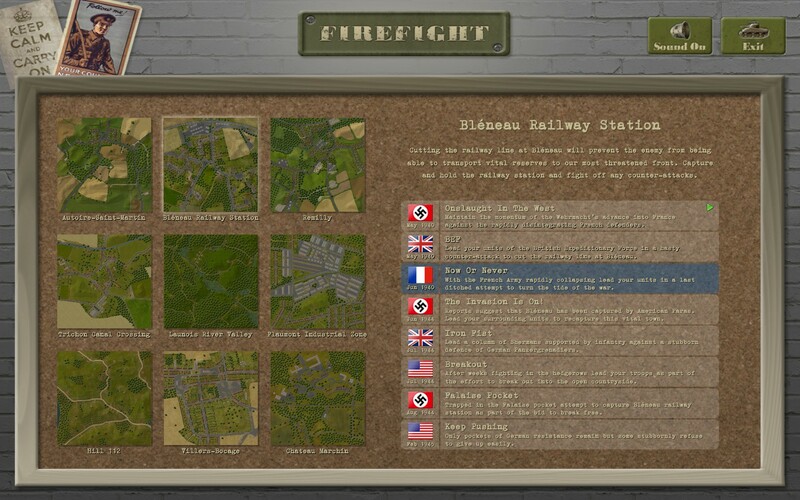 As you have seen in the scenario selection screenshot, all the maps are based in Western Europe. The user interface is adequate and the game mechanics are simple. 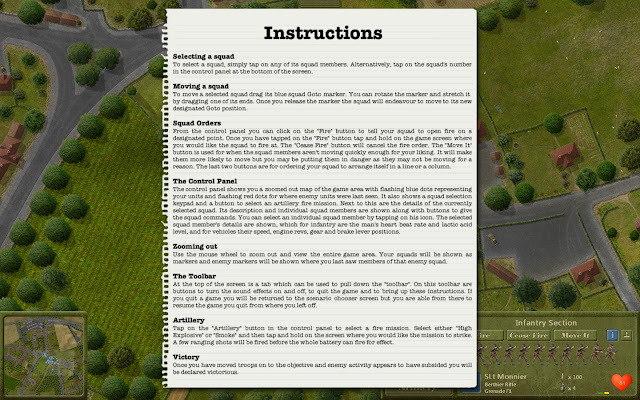 There is an impressive span of variables modelled, like armor penetration (very simple, but it's there), troops stamina and morale, wound types, ammo counts, etc. 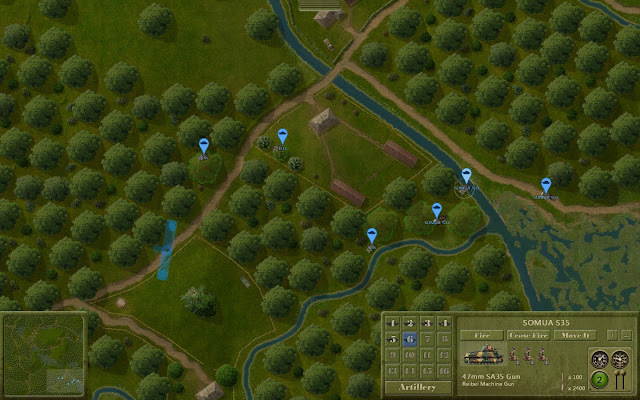 The map is zoomable. 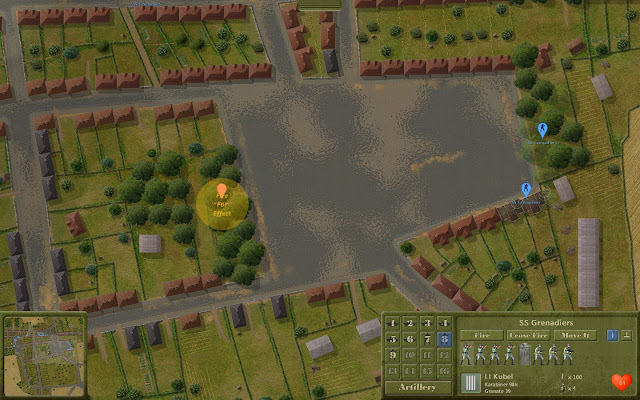 At the lesser magnification setting, a set of red topography isolines to help the player get a better grasp of the terrain folds. At the higher magnification settings the view becomes a bit pixelated, but it shows a good deal of detail of what is going on. 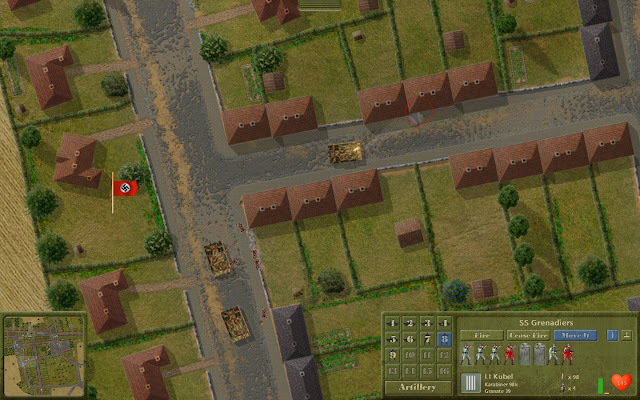 Turrets turning, a lone demoralized infantry man running away from danger and being mowed down by a machine gun, troops entering buildings through doors, etc. 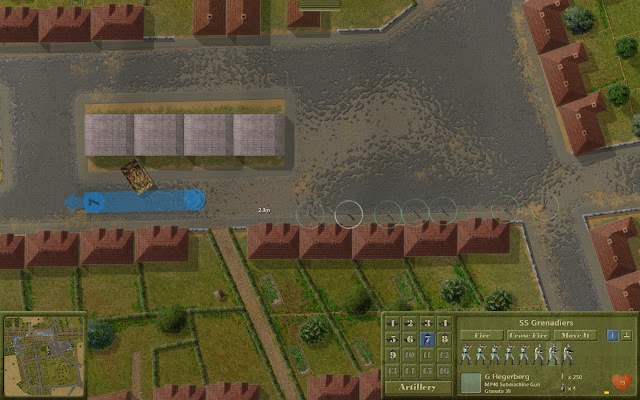 Two things that pleasantly surprised me in Firefight: the unwillingness of troops of vehicles to move to their ordered position if they think they would be in danger and the survivability of infantry. For the later, I remember Close Combat's "crawl of death". That thing is gone in Firefight. 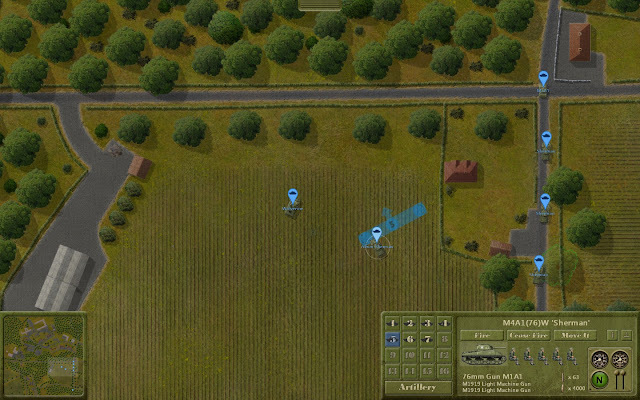 Infantry is very quick to run away from danger/ambushes, they hug walls and prefer a covered route instead of an open field. There are some issues with vehicle pathing, but I always issue moving orders covering very small distances and I rarely notice them. A thing that I noticed is that tanks may sometimes not find a tactically sound facing. But I recognize that on occasion there are enemy groups detected by your own men which are not displayed in the map fast enough and that the groups have a virtual memory and keep targeting/watching position where they may have seen an enemy. Maybe that's why they engage in this somewhat irritating behaviour. Firefight features off map indirect fire (HE, smoke rounds) and in-map mortar teams. 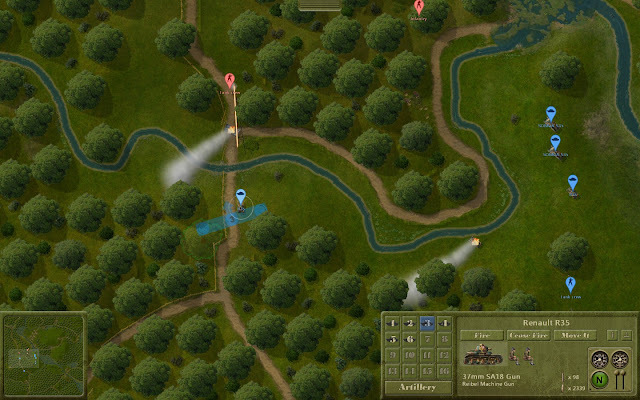 Artillery missions take time to make their way into the target, so be careful not moving your troops into a barrage. 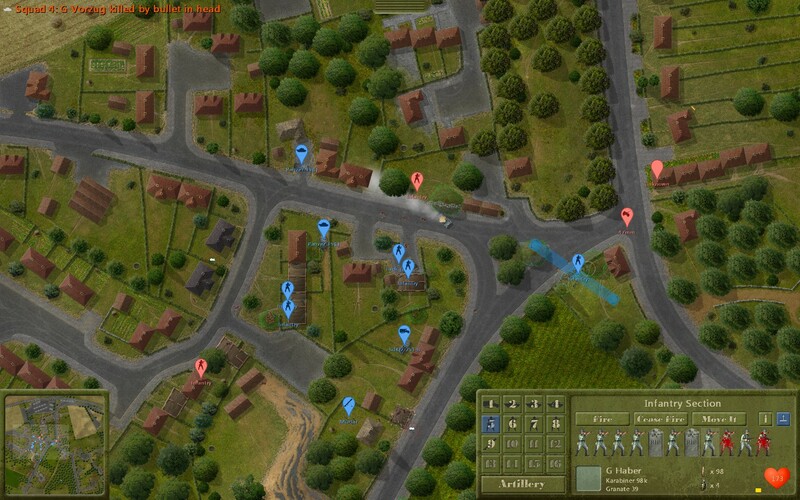 Overall, Firefight is a good value and I'm hoping the game does well enough to support further development. Right now the game plays surprisingly well and offers a sound, satisfying and intense tactical experience. Yet the scenarios feel a bit generic and lacking the atmosphere needed to "put yourself there" in the historical sense. Good review JC! Very much my experience with it, too. Hard to beat the value for the money, warts and all. I would be particularly interested in a full review (though this was pretty comprehensive) and I'd like to know if Soviet content is planned. Ultimately, map making, scenario making, possibly unit creation as well would be good to know about. This could rapidly become quite comprehensive. Hi Doug! Good to see you around here. Thanks for reading and sharing your thoughts. Hi NW. I have no idea about the future of this game. I agree it would be interesting to know about Eastern Front content. But as it is right now, the system is pretty closed to almost everything. I love the way infantry move in the game, better than most RTS game out there. 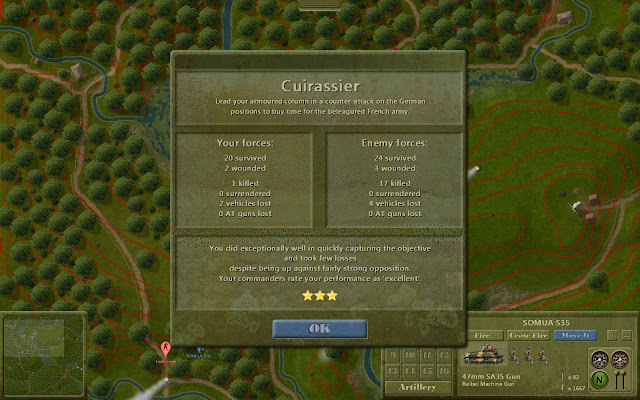 I also love the survivability..on par with Close Combat 1 and 2.
you sold me on this JC. I was going to pass it by after a few comments I read, but for the price you are right it is a solid package of gaming.